When using mobile devices is crucial for your company´s messaging service, both high availability concepts and professional monitoring are a core requirement. The BlackBerry Enterprise MP fulfills this requirement. It discovers and monitors the BlackBerry ecosystem for you to ensure the best possible availability and performance at any time. 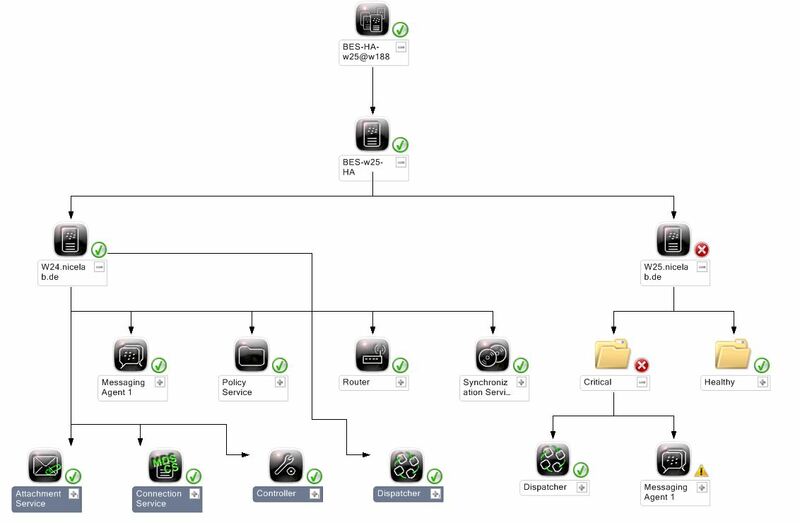 The NiCE BlackBerry Enterprise Management Pack (NiCE BlackBerry Enterprise MP) continuously monitors your BES 12, BES 10 and BES 5 Servers, identifying problems before they affect applications and end users, through the use of predefined event conditions and threshold monitors. The MP increases the productivity of the SCOM administrator and operator, providing them the ability to quickly identify problems and take corrective action to prevent costly downtime. The BlackBerry Enterprise MP extends the SCOM view and scope. It ensures fast problem isolation and identification. This in turn ensures a good user experience and promotes productivity and reduced downtime. Basically, the NiCE BlackBerry Enterprise MP gives you one integration point between Microsoft System Center Operations Manager and your BES 12, BES 10, and BES 5 environments. The BlackBerry Enterprise MP has an easy to deploy architecture that does not require any additional servers, proxies or appliances to be installed. With intelligent System Center Agent Assembly using the System Center SDK, the BlackBerry Enterprise MP can monitor all your BES components such as Collaboration Service, Dispatcher, MDSCS, Router and Enterprise Management Webservice. BlackBerry Enterprise Systems connect to IBM Domino applications or Microsoft Exchange servers. Central to the BlackBerry solution is the BlackBerry Enterprise Service (BES) configuration database. All data and software reside on physical or virtual servers, or both, using physical and virtual storage, and are interacting via multiple network paths. Delayed message delivery, due to performance problems, could source from any point within that given messaging ecosystem. The same is true with faults. They may not necessarily have originated in the BlackBerry Enterprise software itself – they could have originated anywhere. Hence, the key part of managing any environment is the ability to track and trend usage and identify anomalies within one pane of glass. The BlackBerry Enterprise MP for Microsoft System Center Operations Manager gives you one central collection point for all your messaging related resources, such as the BlackBerry servers and devices, email servers, anti-virus plug ins, and instant-messaging servers.